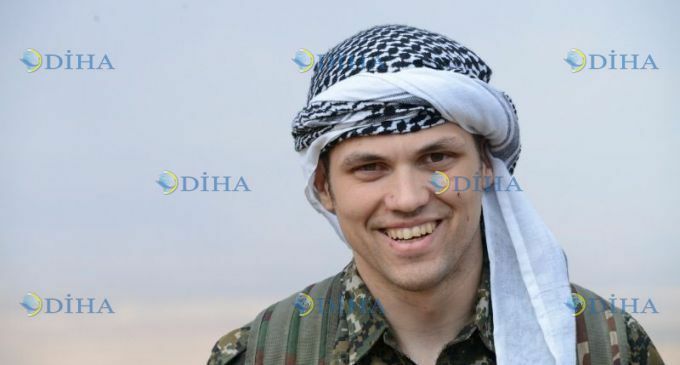 US citizen, and former soldier, Jordan Matson has made his way to Syria and joined YPG Kurdish forces fighting against ISIS. Though several Americans have traveled to Syria to fight for ISIS, he appears to be the first to travel there to fight against ISIS. One wonders if he will eventually be just the first of many. Jordan has the code-name “Serdar” and has already been slightly injured in his first clash against fighters of the Islamic state and killed his first ISIS fighter. A US citizen, Jordan Matson, has joined the YPG ranks in order to fight against ISIS gangs, receiving the code-name “Serdar”. Matson was slightly injured when a mortar shell landed near him in a clash in which 8 ISIS gang members were killed. Matson says he is very content with the attention he receives in the YPG. US citizen from Wisconsin has joined the YPG ranks, which already includes many people from different ethnic groups in Syria and the Middle East in general. Matson says he had informed himself about the struggle of the YPG against the ISIS gangs through the internet in recent times, although he already had information about the Kurdish people. Matson says he decided to join the YPG as he preferred to do something rather than nothing. Matson says the YPG is a bigger organisation than he previously thought it to be and adds that he is happy that he has gained acceptance so quickly in the YPG. Matson says he has been involved in the struggle with his unit for a week, adding that he has started to learn Kurdish. The following interview was conducted with Jordan Matson by Kurdish Ronaha TV. The following picture has been circulating on twitter by both anti-ISIS and ISIS supporters who seem to be particular interested in this brave soldier who has traveled a very long way to take up arms in this fight. Jordan has a Facebook page and last updated his profile on September 30th. We wish Jordan Matson the best and thank him for his both his courage and for taking up arms against this vicious enemy of all civilized peoples. I hope the Kurds take the necessary steps to start accepting and funneling Americans into this fight. There are a lot of people who wouldn’t mind taking a shot at ISIS and if the proper groundwork was laid to help get American veterans into the fight they’d get some volunteers. I’d like to see some volunteer American units set up as auxiliaries with the Kurdish forces fighting in both Syria and Iraq. It has worked out very well for the leaders of The Islamic State who have brought in many thousands of foreign fighters to reestablish the Caliphate and impose Sharia law in the lands they have conquered. Why shouldn’t those who oppose them do the same?